When Chicago Bull attacks the Freak Outpost, Ruby Friday is one of many members at the location. 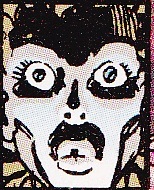 Later when CyberFace announces his reign as leader of the Vicious Circle, Ruby Friday is one of many in attendance. Ruby Friday is later murdered by Dart.